PLAY SOMETHING DIFFERENT Follow your musical vision and express yourself with the unique Newporter Special. The exclusive medium-sized Newporter shape gives it a balanced voice that’s both articulate and powerful, perfect for backing up any singer. 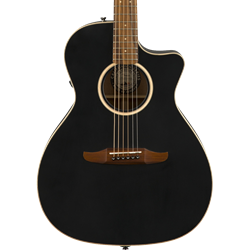 Designed for performing, fully-painted solid Sitka spruce top and painted solid mahogany sides and back, as well as a matching painted 6-in-line headstock and maple binding and rosette give this guitar a shot of electrifying style. Unconventional to the core, the Newporter Special is definitely something different and exciting. Case - Deluxe Gig Bag Included FEATURES Fender-exclusive Newporter body shape Painted solid Sitka spruce top; painted solid mahogany back and sides Fender- and Fishman-designed pickup/preamp system Matching painted 6-in-line headstock Mahogany neck with slim-taper "C"-shaped profile, pau ferro fingerboard and bridge BODY Body Back Solid Mahogany Body Sides Solid Mahogany Body Top Solid Spruce Body Finish Satin Body Shape Newporter Body Binding Maple Bracing Quartersawn Scalloped "X" Rosette Maple NECK Neck Material Mahogany Neck Finish Satin Urethane Neck Shape Slim "C" Scale Length 25.6" (650 mm) Fingerboard Material Pau Ferro Fingerboard Radius 15.75" (400 mm) Number of Frets 20 Nut Material Bone Nut Width 1.69" (43 mm) Position Inlays Maple Dots ELECTRONICS Controls Volume, Bass, Treble, with Tuner and Phase Controls HARDWARE Bridge Modern Viking Bridge Pins Ebony with Mother-of-Pearl Dots Hardware Finish Chrome Tuning Machines Sealed Nickel Pickguard None MISCELLANEOUS Strings Fender® Dura-Tone® Coated 80/20 Bronze (.012-.052 Gauge) Legal Notice WARNING: Cancer and Reproductive Harm - www.P65Warnings.ca.gov.